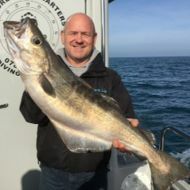 Fishing for these King Flat Fish from Brighton Marina is a great day out! It’s a more relaxing, exciting way of enjoying a Brill Fishing or Turbot Fishing Trip. Catching our bait in the morning going the banks and finding the specimen, it sure has its perks. While not having to reel in lines all the time, is really liked by some of the anglers, due to the fact we use bait on these Day Trips. It does make it all the more enjoyable and more of a social experience, as you can rack your rod up making time for the anglers to enjoy the summer weather. We Fish for these specimens of the deep during the mid to late summer months from about July through to September making it a good time of year for Fishing, friends and the family! There are other Fish to be had on these spot’s apart from Turbot there are fantastic sized Brill, Greater Weever (so watch your fingers), some big Plaice, Huss, Hound, and an occasional Shark or Ray with some Ray gets well above 10lbs and a few decent sized Smooth Hounds around the 7lbs and up mark. So you never know just what you could get, even a really good sized Tope, permitting you hook him just right and in the lip!